Duodenal cancer is a rare condition where malignant cells develop in the duodenum, which is the first region of the small intestine. After food is mixed with gastric acid from the stomach, it then travels to the duodenum, where bile from the gallbladder and digestive juices from the pancreas are added. This is also the area that is responsible for starting the absorption of vitamins, minerals, and other nutrients. An adenocarcinoma is a form of cancer that impacts cells responsible for the production of digestive enzymes, mucus, and other chemicals used in digestion. Sarcomas, on the other hand, are malignant tumors that are found in the soft tissues of the body. These include fat, blood vessels, and muscles. Lymphomas are typical cancers of the immune system. Gastrointestinal stromal tumors develop in the gastrointestinal (GI) tract walls. Carcinoid tumors are the most common type of cancer in the GI tract. These can metastasize and affect other areas of the body. Cases of duodenal cancers are rare – it only makes up three percent of all carcinoids in the GI tract. It also is one of the reasons that make it treatment challenging for cancer specialists. A lot of risk factors contribute to the development of duodenal cancer and those of the small intestine. These types of cancers appear in men, as well as those above 60 years old. While smoking and alcohol use have been known to increase the risk of certain cancers, not all studies have found it to be conclusive for duodenal cancer. 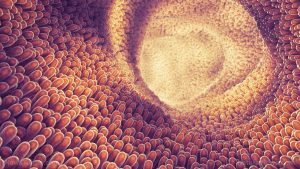 People with celiac disease – a condition which triggers the body to attack the lining of the intestines once it is exposed to gluten – are also more likely to get small intestine cancer. Those with pre-existing conditions affecting the GI like colon cancer and Crohn’s disease are also at risk. The most common symptom of duodenal cancer is abdominal pain, together with diarrhea. This type of cancer affects the duodenum, but severe complications may increase its effect in areas where cancer has metastasized. Proper diet is already half the key to preventing most forms of cancer. In particular, here are some suggested food items to help deal with duodenal cancer, as well as those of the small intestine as well. Grape seed extract — This contains natural tannins and polyphenols that possess antioxidant and anti-inflammatory properties which help keep cancer at bay. Cat’s claw — The bark and root of this woody vine protect the body against free radical damage which increases the risk of certain cancers. Ashwagandha — When dried, the root can be ground to make tea. This helps improve digestion and reduce inflammation. Cannabis oil — A known anti-inflammatory agent, cannabis oil has been used together with chemotherapy in cancer patients. Curcumin — The active ingredient in turmeric, congesting turmeric is a sure-fire way to hit cancer cells. Skullcap — This is a Chinese ingredient known to remove toxins from the GI tract, and it contains the anti-cancer agent baicalein. There are various ways to deal with duodenal cancer, depending on its severity. One such method is surgery, wherein the doctor will remove the cancerous portion of the duodenum. Another method is chemotherapy, which uses drugs to kill cancer cells. However, small intestine cancers may not respond to this procedure. Radiation therapy, on the other hand, blasts the area with cancer with high-energy radiation. Duodenal cancer is a rare condition where malignant cells develop in the duodenum. Cases are rare, with only three percent of all carcinoids in the GI tract. These types of cancers appear often in men, as well as those above 60 years old. While smoking and alcohol use have been known to increase the risk of certain cancers, not all studies have found it to be conclusive for duodenal cancer.